Immigrants who want to become British and settle permanently in the UK will need to pass more tests to "prove their worth" to the country under new plans. Some migrants may also have to pay into a fund towards public services and have a period of "probationary citizenship". Prime Minister Gordon Brown said the UK should expect a "demonstration of commitment" and the process of becoming a citizen should be "more exacting". The Tories called the plans, which do not cover EU citizens, a "gimmick". Unveiling the proposals, Home Secretary Jacqui Smith said future migrants would need to "earn" citizenship. This scraps the current system which allows people to apply for naturalisation on the basis of how long they have lived in the UK. Ms Smith said migrants from outside the European Economic Area would be encouraged to "move on" through a system that leads to citizenship - or choose ultimately to leave the country. In a speech to the Institute for Public Policy Research think-tank, Mr Brown said the UK had to be "far more explicit about the ties - indeed the shared values - that make us more than a collection of people but a country". Earned citizenship would include "clear rights but also stronger obligations at each stage". Mr Brown added: "And we will emphasise what binds us - showing that our tolerance and fairness are not to be taken advantage of - without diminishing the diversity of what we hold dear." Press reports suggest the transitional impact fund would raise £15m a year. The system could see migrants with children or elderly relatives expected to pay higher application fees. Migrants would find their route to citizenship and full access to benefits, such as higher education, accelerated if they can prove they are "active" citizens. This would include charity work, involvement in the local community and letters from referees. At the same time, those who break the law would find the process far harder - or would be barred completely from becoming British. The Home Office said that it would still be possible for someone to be permanently resident as a foreign national in the UK - but it would be preferable for them to seek citizenship because of the benefits it would bring. But the Conservatives said the proposals were a "gimmick" and called for an annual limit on immigration instead. Shadow home secretary David Davis called it "a complicated, expensive, bureaucratic set of mechanisms to deal with the adverse consequences of out of control immigration". "The sensible approach is very simple. Deal with the original cause of the problem. Put a limit on the level of immigration. Bring it down to manageable levels. It is simpler, it is cheaper, and it is better for Britain. "And it will preserve Britain's excellent history of good community relations that is being put at risk by an immigration policy that is both incompetent and irresponsible." Liberal Democrat justice spokesman David Heath welcomed the points-based system, but said proposals were so "vague and so full of holes" that they were "nowhere near" meeting needs. Several Labour backbenchers also criticised the government's plans. Diane Abbott, MP for Hackney North and Stoke Newington, said they would force non-European migrants to pay fees that would benefit European migrants. She said: "How can it be fair for non-white immigrants to have already steep fees ratcheted even higher to pay for issues which relate to the broad immigrant population including immigrants from the EU countries?" Fiona Mactaggart, MP for Slough, said: "One of the reasons we have such excellent race relations in Britain is because migrants to this country relatively quickly achieve permanent residence, unlike other countries in Europe for example, where their status remains insecure and unclear for a long time. "I am very concerned that these proposals might damage our good relations." UK Independence Party leader Nigel Farage said: "They [the government] keep bringing out the same old story and pretending it's new, and every time they ignore the crucial fact that these rules do not apply to 450 million people. "It's about time they were brave enough to have a proper debate on immigration which includes the EU dimension." 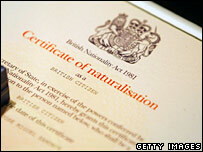 Have you recently become a British citizen? Do you have pictures of your citizenship ceremony?